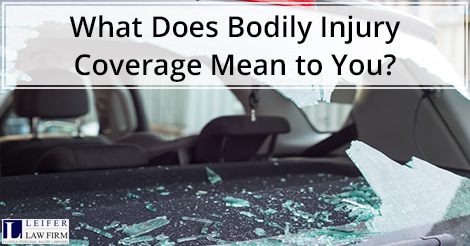 What Does Bodily Injury Coverage Mean to You? Car insurance can be a complicated topic in Florida. Because the state of Florida requires registered drivers to carry Personal Injury Protection insurance (PIP), this type of insurance covers insured, underinsured, and even un-insured motorists. As Boca Raton car accident attorneys, we believe auto insurance is of paramount importance if you are involved in a serious car crash with injuries. Car insurance can be a complicated subject, which is why we are breaking it down for the everyday individual to understand. Read on to learn more information to make informed decisions about your safety behind the wheel and on the road. Bodily injury coverage is not mandatory in Florida. In some cases, such as when a driver has been convicted of a DUI, it does become mandatory under Florida Statute 324.023. What is Florida’s Financial Responsibility Law? Motorists who choose not to purchase bodily injury coverage should be aware of Florida’s Financial Responsibility Law. The Financial Responsibility law requires all drivers who are determined to be at fault for a car accident to pay coverage in the amount of $10,000 per person and $20,000 per accident. This means if you are responsible for an accident that causes bodily injuries to another individual, you must either: pay for this coverage out of pocket, or file the claim through your insurance company if you have that coverage option. If you are hit with a bodily injury case, and you do not have bodily injury liability insurance, then your financial security could be in serious jeopardy. This is why it is important to consider purchasing bodily injury coverage. What Auto Insurance Does the Law Require? If you own a vehicle in Florida, you are not required to carry bodily injury coverage, but you must carry certain types of insurance. These types are Property Damage and Personal Injury Protection. The law requires drivers to have at least $10,000 in Personal Injury Protection insurance and $10,000 in Property Damage liability insurance. These two types of coverage are required by state law, but they are not considered “full” coverage. In many cases, motorists think they are fully covered when they have the minimum state insurance requirements. This is not an accurate assumption. Just because the law requires you to have specific levels of coverage doesn’t mean all motorists abide by these rules. What happens if you are the victim of a serious car accident caused by someone else? What if the other driver is at fault but does not have bodily injury coverage? What if the other driver does not have any resources or assets to pay your damages? Learn more about PIP insurance and how it works in Florida here. This is where uninsured (or underinsured) motorist coverage comes into play. Uninsured motorist (UM) coverage pays you if an uninsured or underinsured driver injures you. Having UM coverage can give you much-needed peace of mind. An accident can come out of nowhere, leaving you with devastating injuries and other costs, such as medical bills, time off work, and expensive prescriptions. Auto insurance is not always easy to figure out. Your Boca Raton car accident attorney can help explain insurance in more detail should you find yourself in an accident and facing insurance companies. What will you do if you are injured in a catastrophic car accident? Make sure you have enough insurance to take care of you and your family.